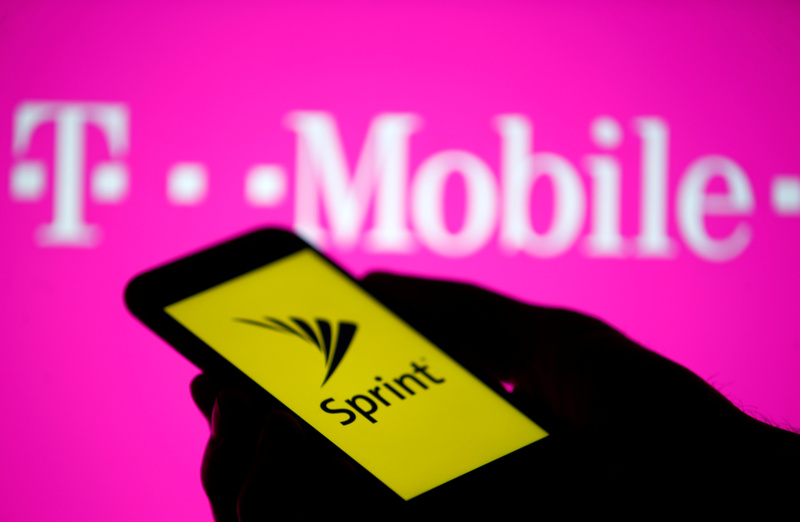 A smartphone with Sprint logo are seen in front of a screen projection of T-mobile logo, in this picture illustration taken April 30, 2018. The U.S. Justice Department has told T-Mobile US and Sprint that it opposes their planned merger in its current form, Reuters said on April 16, citing a source familiar with the matter. The two U.S. telecom operators announced an all-share deal on April 29, 2018. As of the market’s close on April 16, they had a combined market capitalization of $87.5 billion. T-Mobile has argued that the combined company would be better at building 5G, the next generation of wireless, to compete with industry leaders AT&T and Verizon Communications. The merger has received national security clearance, but still needs approval from the Justice Department and Federal Communications Commission.